Click on any image below to show a larger version. It can be easy to miss important objects when searching the seabed or foreshore using eyes alone so portable metal detectors and hand-held magnetometers are used to improve the search method. Your eyes can only identify what they can see so these instruments aid the search by detecting metal objects that perhaps you cannot see. The instruments are swept over area to be searched ensuring that all of the ground is covered and no gaps are left in the search pattern. Anything detected by the instruments can be marked for later positioning and further investigation. Both instruments are unaffected by visibility so can work in poor or nil visibility conditions. A pulse induction metal detector is a short range instrument for detecting many different types of metal. This type of metal detector is usually in two parts, the electronics pod containing the processing circuitry and battery along with a loop or probe sensor attached to it by a cable, often they are both attached to a plastic frame with a handle. The operator may see the presence of metal objects reported on a display but more often it is done by sound signals through headphones or a bone conduction microphone. This instrument works by setting up its own magnetic field within a coil or probe sensor which gets distorted by the presence of any conducting metal in that field, the distortion in the magnetic field can then be detected by the instrument and reported to the operator. Controls on some instruments change the instruments ability to detect different materials or to reject the signals from smaller objects such as metal foil. This type of metal detector will find iron, steel, copper, copper alloys, gold, silver and any other conductive metal. On the Formiche site in Capraia, Italy, a metal detector was used to locate buried ceramic fragments as they were unusually conductive and could be detected. This type of metal detector has a very short range and the sensor coil has to be kept very close to the seabed to detect any metal objects. The diameter of the sensor coil affects the distance at which objects can be detected so a larger coil can detect objects further away. For example, the Aquascan AQ1-B (Fig. 2) can detect a small copper coin 340mm away with a 200mm diameter loop and 410mm away with a 380mm diameter loop. However, smaller loops are easier to move around especially when searching in thick weed or in deep gullys. There are many manufacturers of underwater metal detectors and they all behave differently so choosing a good one can be difficult. One of the most significant factors is how robust they are as some do not survive well on archaeological projects. It is also necessary to consider how and where the instrument will be used as that affects how it is carried. The Aquascan unit in fig. 2 is in two pieces and is designed to be clipped on to the diver leaving his hands free when not in use whereas the one-piece Garrett instrument in fig. 3 has to be carried. The two-piece rig works well in confined spaces but the one-piece rig is often better when searching large flat areas. Instruments have different ways of reporting that they have detected a target. The Aquascan unit gives a continuous signal when the coil is over a piece of metal but the Garrett only reports a signal when the coil is moved over a piece of metal and goes quiet if it is left stationary over the top of the object. In the field having the continuous tone makes it easier to locate smaller objects in poor visibility. With metal detectors that have tuning controls the controls need to be set correctly to ensure that the objects being searched for can be detected. The instrument may work differently at different water depths so may also need tuning correctly once on site. One solution to this problem is to carry a small piece of metal and using that as a test piece to correctly set the controls on the metal detector. The hand-held magnetometer can detect iron and steel over distances of many metres. Two types are available, the proton magnetometer sensor and the dual fluxgate sensor. 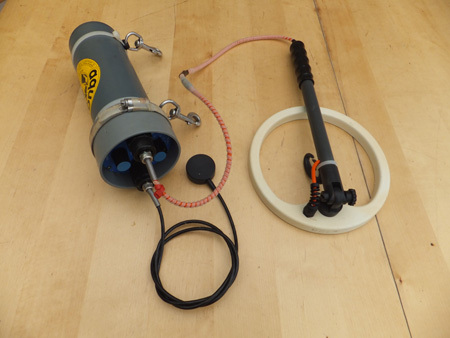 The proton sensor is fitted in the JW Fishers Divermag1, this instrument is essentially an underwater version of a towed proton magnetometer. As with all proton instruments it has a slow maximum update rate of one measurement every 2 seconds which would limit its ability for finding small objects. The instrument also does not provide any direction information about the location of the object being searched for which will make searching more difficult. The Aquascan DX-300 magnetometer uses the fluxgate method. Iron and steel objects bend the Earth's magnetic field, the amount the field is distorted increases the closer you get to the object and this is the effect the DX-300 uses to detect and locate objects. 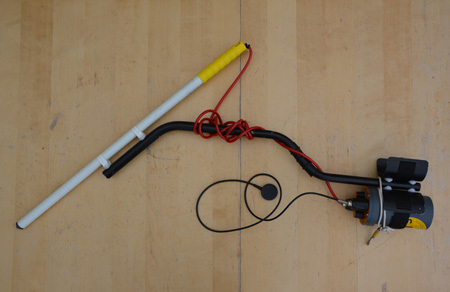 Two fluxgate sensors mounted inside a 600mm (24in) rigid probe are used to measure the field gradient, or the change in magnetic field along the length of the tube (Fig. 4). When the tube is pointed towards an iron object the magnetic field at the end nearest the object is stronger than the end furthest away and that difference in field strength can be measured. if the probe is pointed sideways to the object then the field strength at each end of the probe is nearly the same an no difference is measured. This allows this type of magnetometer to give strength and direction information to the user to allow them to 'home in' on the metal object being located. The instrument can report its magnetic field measurements to the user by changing the tone of a sound signal through headphones. Having a detection distance of a few metres this instrument has been useful for locating targets on the seabed found during towed magnetometer searches. This type of magnetometer is ideal for searches in low visibility or in cluttered conditions like thick weed or kelp. 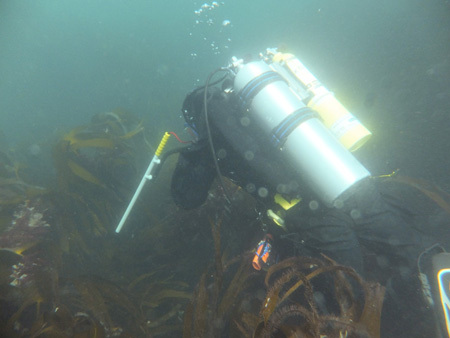 Pulse induction metal detectors are useful in thick weed but the need to keep the sensor loop close to the seabed and within the weed slows down the search, but the DX-300 allows the diver to swim over the weed and still detect iron objects on the seabed. As this instrument detects steel the diver carrying it must use aluminium tanks otherwise they will spend the dive detecting themselves. 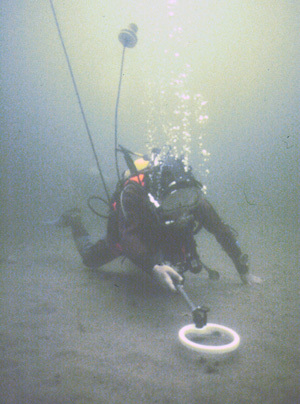 The diver should also not carry a magnetic compass as this can be detected by the instrument. If the diver has a buddy and they need to be close then they too should carry the minimum of steel objects as well. This instrument also does not work well close to a steel dive boat, close to an iron or steel wreck or near anything else that can distort the Earths magnetic field such as high tension power lines. This instrument is very good at locating cables but because of the unusual magnetic signature of cables it tends to home in on the ends rather than the middle of the cable. 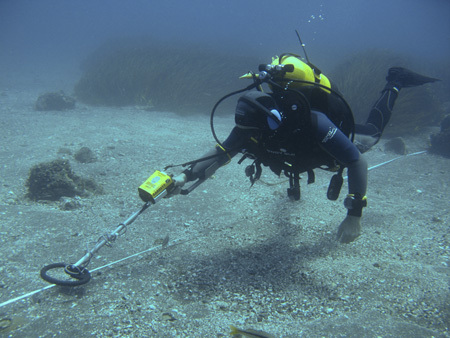 Metal detector - An underwater metal detector is used to detect metal objects on or just under the seabed.